In Pondicherry, visit cover beaches, Aurobindo ashram, Museum, churches and Auroville. Day 01 Arrival in Chennai : Meet our representative upon arrival in Chennai – the capital city of Tamil Nadu is sited on the Coromandel Coast of the Bay of Bengal. It has played a very crucial role in the traditional, historical and academic growth of the country, representing the different elements of the highest variety of the Dravidian civilization. 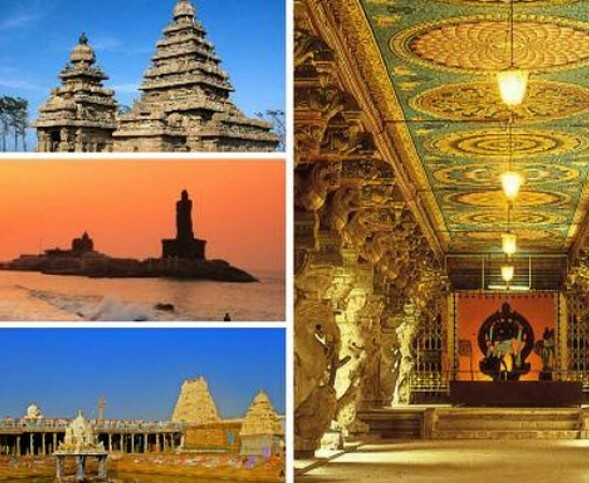 Also, considered as the cultural hub of South India which is famous for its affluent heritage in classical dance, music, architecture, sculpture, crafts, etc. After reaching, proceed to hotel and check-in for overnight stay. 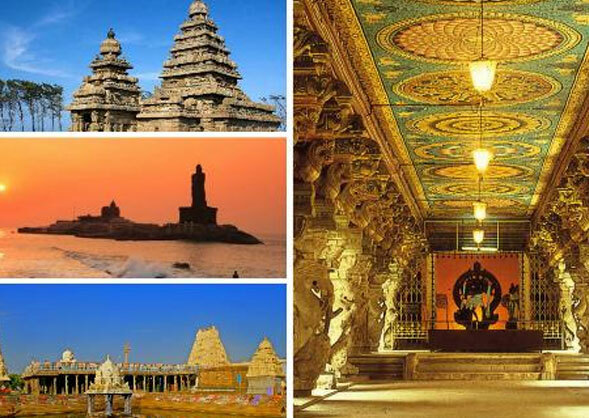 Day 02 Sightseeing in Chennai : Explore Chennai- Visit Fort St George, St. Mary’s Church and a museum, Kapaleeshwarar Temple, San Thome Cathedral, Government State Museum & National Art Gallery. Drive past Marina Beach, the second longest beach in the world. Overnight in Chennai. Day 03 Drive from Chennai – Mahabalipuram (65 kms / approx. 1.30 hours) : Drive to Mahabalipuram. Arrive and check-n to your hotel. Later, proceed for the sightseeing of Mahabalipuram. Mahabalipuram lies on the Coromandel Coast, and was a well-established seaport between the 7th and 10th centuries. Visit the Panch Rathas or Five Ratha temples…. of the nine monolithic rock-cut temples found in Mahabalipuram, the most important are these, dedicated to the five Pandava brothers from the epic Mahabharata. The Dharmaraja Ratha is named after the eldest Pandava, and is the largest one in the lineup. It is dedicated to Lord Shiva. Visit Arjuna’s Penance, the massive rock cut bas relief sculpture. It measures 27 meters in length and 9 meters in height, and depicts the story of Arjuna. Later, visit the Shore Temple … a five-storied structure made out of finely cut granite, and one of the earliest and most important structural temples. UNESCO has listed it among the world heritage sites. Overnight in Mahabalipuram. Day 04 Drive from Mahabalipuram – Pondicherry (110 kms / approx. 3 hours) : After breakfast check-out from the hotel and proceed to Pondicherry- the older part of this former French colony has a lot of quiet, clean, shady, cobbled streets, lined with mustard-yellow colonial townhouses numbered in an almost logical manner. Enjoy sightseeing of Pondicherry, starting with Aurobindo ashram – Founded in 1926 by Sri Aurobindo and a French-born woman known as ‘the Mother’, this spiritual community now has about 1200 members who work in the ashram’s many departments. Also, cover church of sacred hearts of Jesus, Pondicherry Museum, beaches and a must-visit attraction of Pondicherry – Auroville. Overnight stay in Pondicherry. Day 05 Drive from Pondicherry – Tanjore (170 kms / approx. 4 hours) : After breakfast, check-out from the hotel and drive towards Tanjore. Arrive and check-in at the hotel. Overnight stay in Tanjore. Day 06 Tanjore – Trichy – Madurai : After early breakfast, check-out from the hotel and explore Tanjore – Visit Brihadeshwara Temple, Tanjore Palace & Museum. Later drive towards Trichy (approx. 2 hours) and enroute visit Rock Fort, Srirangam and Thiruvanaikkaval. By evening, reach Madurai hotel (approx 3 hours) for check-in and overnight stay. Day 07 Sightseeing in Madurai : Visit the Meenakshi Temple, Gandhi Memorial Museum, Tirumalai Nayak and Koodal Azhagar Temple. In the evening, re-visit the Meenakshi Temple to witness the evening prayer ceremony at the temple. Overnight Madurai. Day 08 Drive from Madurai – Kanyakumari (245 kms / approx. 5 hours) : After breakfast, proceed to Kanyakumari. The Arabian Sea, the Indian Ocean and the Bay of Bengal merge at Kanyakumari. It is an important pilgrimage center for Hindus. Upon arrival in Kanyakumari, check-in at the hotel and proceed on a visit to Vevakananda Rock, Gandhi Museum and Kumari Amman Temple. Also, enjoy the scenic sunset point in Kanyakumari. Overnight stay at the hotel. Day 09 Drive from Kanyakumari – Kovalam (90 kms / approx. 2 hours) : After breakfast, drive towards south of Kerala, Kovalam- located close to the state capital Trivandrum, it is internationally famed for its palm-fringed beaches and rejuvenating centers. This coastal town initially came to notice with the construction of Halcyon Castle by the last Maharani of Travancore – Sethu Lakshmi Bayi. With the arrival of hippies in 1970s, the place gained recognition as a tourist destination and is today renowned for its 17 km-long coastline, which is formed by three beautiful beaches – Lighthouse, Hawah and Samudra. Upon arrival, check-in at hotel and spend rest of the day at leisure. Overnight in Kovalam. Day 10 Sightseeing in Kovalam and Trivandrum : After breakfast, explore highlights of Kovalam- covering lighthouse, Vellayani Lake and Valiyathura Pier. Afternoon, enjoy a half-day sightseeing trip of Trivandrum. Visit the Napier Museum, built in the 19th century. This Indo – Saracenic structure boasts of a “natural” air-conditioning system, and houses a rare collection of archaeological and historic artifacts… bronze idols, ancient ornaments, a temple chariot and ivory carvings. Located near the Museum, the Shree Chitra Kala Art Gallery displays select paintings of Raja Ravi Varma, Svetlova and Nicholas Roerich, and exquisite works from the Rajput, Mughal and Tanjore schools of Art. Visit the Kuthiramalika Palace, built by the King of Travancore. The palace museum displays paintings and various priceless collections of the royal family. Overnight stay in Kovalam. Day 11 Departure from Trivandrum : After breakfast, you will be transferred to Trivandrum airport for return flight back home.